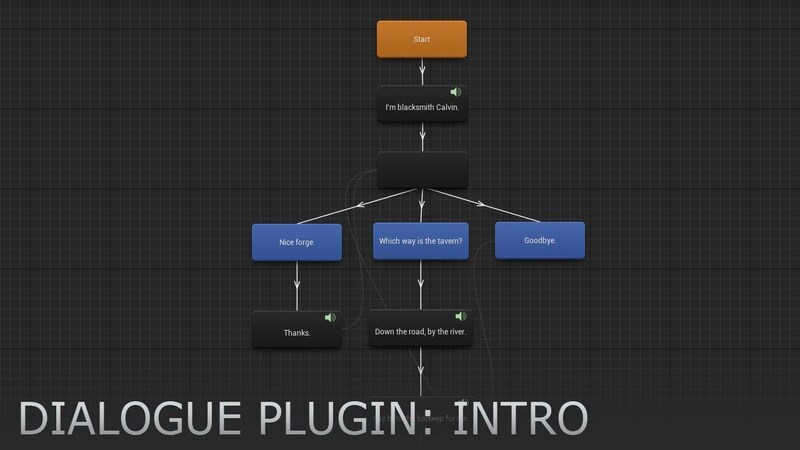 I'm very happy to announce Dialogue Plugin, an editor extension that allows you to easily create dialogues in UE4, through a custom node-based editor. I've wanted to create a dialogue editor for more than a year now, and I've always felt that the ideal editor should be 1) node-based and 2) fully integrated, without the need of 3d party software such as Excel. Now I finally did it. Last edited by CodeSpartan; 04-04-2019, 09:00 PM. Hey [MENTION=25447]CodeSpartan[/MENTION] - This looks like a winner what is the price? No submitted plugins have made it out of the Marketplace yet, I understand? Are complex conversations possible? For instance, random NPC comments, greeting/goodbye statements selected from lists, replies based upon NPC personality type. How would you do Localization? How do the conditions effect branching, like in the witcher with decisions? What versions are you going for currently? Hi everyone. Thanks for your interest. I'm the second co-author of this plugin. - Yes, there are conditions, they allow branching and they're really easy to use. You can make your own conditions, such as check if player has X amount of gold/item(s), or if he's completed a certain quest, or check any variables. We'll make a 1-2 min tutorial about conditions later, hopefully before the plugin gets approved on the marketplace. There are also events that use the same principle, but instead of checking for things, they perform things, for example give gold/item(s) to player, play a montage, set a variable, etc. 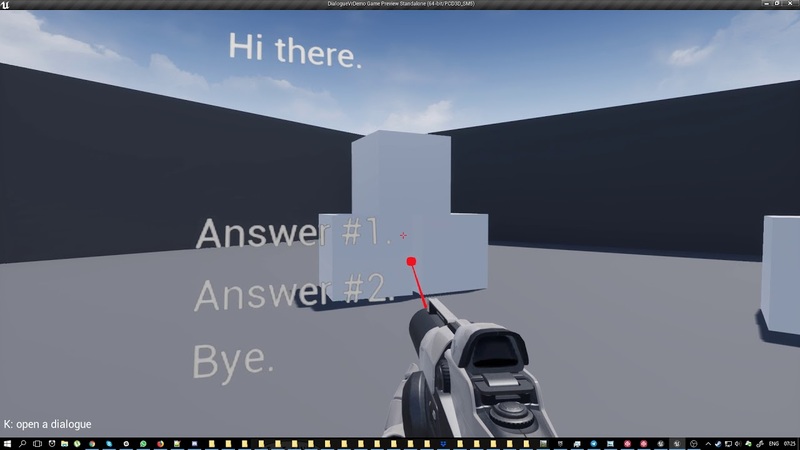 - UE4 native localization system works with the Dialogue Plugin. - We're going to submit and provide support for UE 4.11 and higher. If you want to use the plugin with a lower version, you'll have to change a couple of nodes in the UMG widget. We're only using one new feature (sound concurrency) from 4.11 for voice-over. - The price will be set at $65. You mean the front-end dialogue widget for a 3d person template? Sure, the widget from the video is included with the plugin. Last edited by Glabrezu; 04-01-2016, 03:46 PM. The dialogue plugin looks very promising. Is there an alternative way to acquire it before it gets released on the marketplace? This looks amazing, it would love to get access to it asap trough an alternate source. Day 1 buy for me. Looks clean, simple and to the point. Current Project - *shush shush* Soon. Soon. I understand that this has support for voice overs, however, could this drive a text to voice engine / plugin? Will you be able to trigger animations from within the dialogue editor, the same way you can trigger sound? The video shows that each node has both a sound input and a voice-over input. What's the difference between the two? 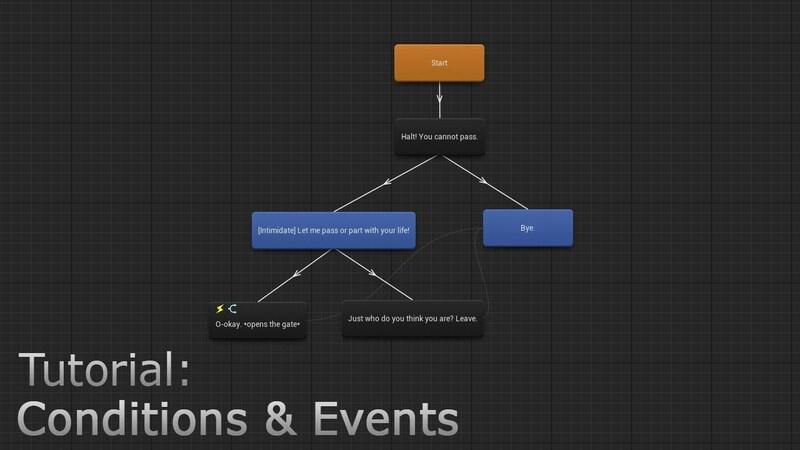 Will you be able to set variables within the dialogue editor? Can you assign different controller buttons to different dialogue options? So, for example, if I have four dialogue options, could I assign the Y button to the first, B to the second, A to the third and X to the fourth option and rather than clicking on a dialogue option, I could simply press the corresponding button to trigger it? I'm assuming you can also display the dialogue options in 3D space (like in Heavy Rain/Life is Strange) if you make your own custom widget for it. Is that correct? I'm super excited for this one. I bought a dialogue system previously that was reliant on data tables and found it to be way too prone to error when moving writing over from something like Articy. Being able to do it in the editor like this would be fantastic! Can you run Blueprint functions from dialog responses? If its a C++ plugin will the source be available?